I often get asked how I keep producing projects for the blog. I am usually doing multiple quilt projects at once. You can do it too! It takes a little planning and a little organization but it's not hard to do. It really does make quilting go quicker and might get a few naysayers off your back when they see how much you are getting done. 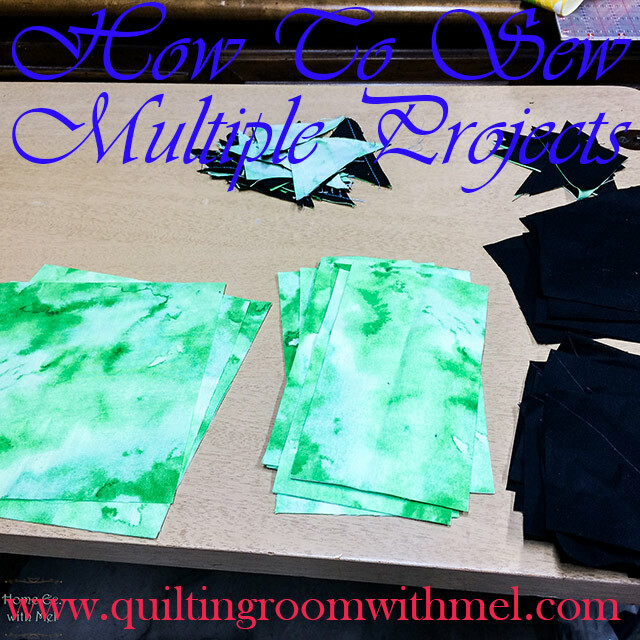 Are you ready to learn how to piece multiple quilt projects at once? The first thing you need to do is plan out your projects. You need at least two projects but the more the merrier. Once you have picked your projects you need to make sure you have all of your fabrics you need. When we start sewing we don't want to have to stop for any reason. I kit up my projects. Some people think when I talk about kits I am going out and buying a kit. I'm not. When I say I kit up a project it means I cut everything I need for the project and put them in something together. I really like oversize freezer bags and kitchen drawer organizers. They keep all my pieces together. I always have two projects on my sewing machine though they aren't always set up in the bags or the organizers. I did a time lapsed video of me working. This is just to give you an idea of how I do it. You may recognize the blocks I'm working on in the video. It's my Amish Diamond block. I normally don't pile my pieces in front of my machine lie in the video. You'll notice I never leave my needle empty. I sew until my piles need to hit either the cutting mat or iron. When I get to that point I sew a piece from another project, in this case, the bonus half squares from the Amish Diamond block. Those half square triangles will be another project so I am building those blocks up. I won't have a lot of them done but I have a good start. I always try to stay at least one project ahead so that I'm always getting just a little bit done on that next project. Getting a couple of blocks done while working on another project really makes you feel good. 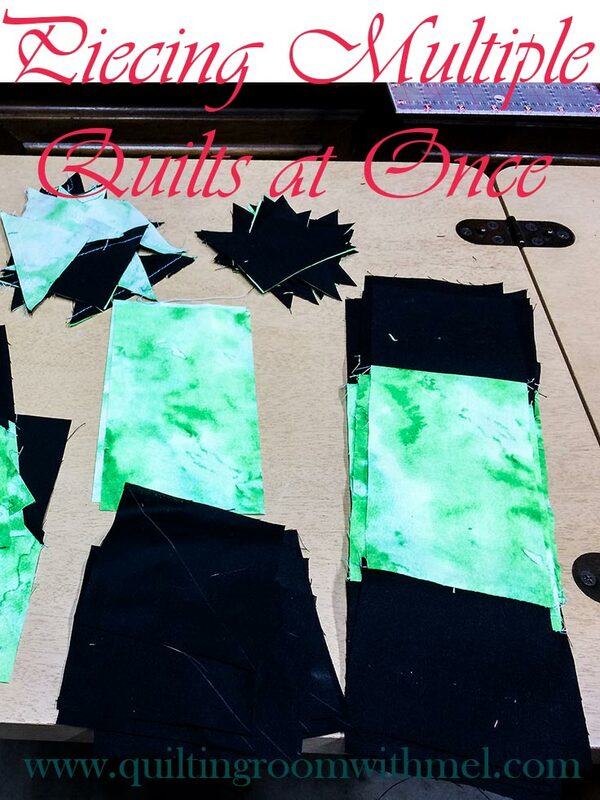 Projects with a lot of piecing will give you more of a head start on your next project. The key is never to leave your needle empty. The other benefit to piecing multiple projects at once is you actually use less thread. When you aren't pulling out all that extra thread between pieces you are saving a ton of thread. Chain piecing, which is what we are doing, really keeps your thread in the fabric and not in the trash. When it comes time to cut your chain apart you can pass it off to a kid. That was my job for my mom cutting her chains apart. If you don't have a kid and you can't snip all those threads I highly suggest The Gypsy Cutting Gizmo. It makes cutting the pieces apart and there's no squeezing of scissors. If you want more tips on how to make your sewing and quilting easier be sure to sign up for our newsletter below. You'll get a printable to do list to help you stay organized. Don't forget to pin the image below or hit the share button so that you can find this post again.